I LOVE CHOCOLATE! I really do love chocolate! 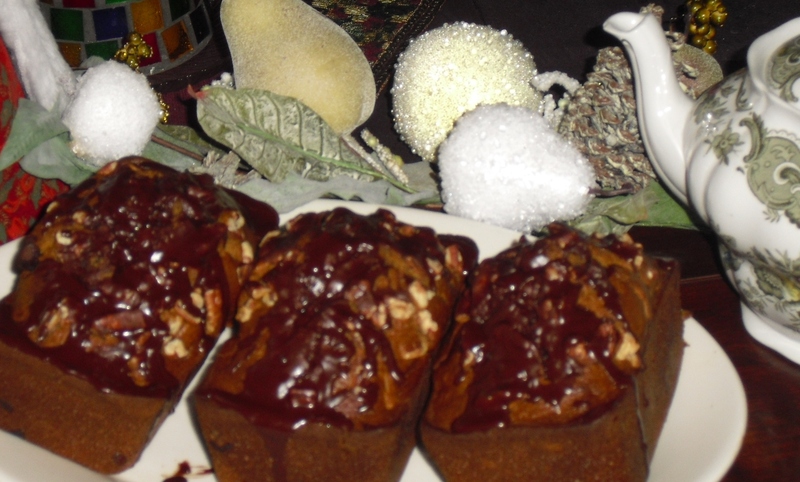 ONE CHRISTMAS several years ago, my Mother altered her annual pumpkin bread recipe by adding chocolate chips. I loved it!.. LAST YEAR, as I was preparing to make pumpkin bread for the holidays, I remembered her chocolate chips recipe. I decided to amp it up a few notches more by adding cocoa and Godiva Chocolate Liqueur. I am making it again this year, as it was a big hit – (although I likely gained some weight eating too many pieces). MY BROTHER MILT frequently brings Godiva chocolates when he arrives for Christmas. It is well known in the Marquis family that chocolate is a favorite of so many of us. I developed this recipe using Godiva Chocolate Liquor for extra flavor for all the chocolate lovers – and of course named it for Milt. YOU CAN ADAPT A FAVORITE PUMPKIN BREAD RECIPE or use a box mix, jazzing it up with various rich and spicy and chocolate flavors for the holidays – I added pumpkin puree and an additional egg as well. In this recipe, I used World Classics Pumpkin Spice Muffin and Bread Mix I purchased from Trader Joe’s. My recipe can be doubled and it freezes well. I typically make it in mini loaf pans and freeze them, so I can pull one or more out as I wish based on the number of guests present. THIS IS GREAT IN THE MORNING WITH COFFEE or in the evening after dinner. 1 box pumpkin bread mix (I used World Classics Pumpkin Spice Muffin and Bread Mix. PREHEAT OVEN to 350 degree. Beat eggs well and add pumpkin puree, vegetable oil, Godiva Liqueur and water. MIX WELL BUT DO NOT BEAT. Fold in chocolate chips and chopped nuts. Pour into a regular sized loaf pan or three mini loaf pans. Bake for 55-60 minutes or 30-40 minutes for mini pans. Check with cake tester and remove when done. Do not overbake so bread is moist. WHILE LOAF IS COOLING, mix powdered sugar, cocoa, butter, Godiva liquor and vanilla for glaze. Blend and spread on warm loaves. Sprinkle ground pecans on top whil glaze is still soft and press down gently to settle nuts in glaze. Sprinkle on a few chopped nuts. TO SERVE, sprinkle cocoa around the outside edges of a pretty plate and place a slice of the pumpkin bread in the middle. Serve with a dish of cold peaches with vanilla whipped cream and coffee (or a small nip of Godiva Chocolate Liquor for the real chocoholics). Hope this works out for you if you try it. it’s an honor for me , I want to thank you very much ………………..
Could you tell me where I could find that Godiva chocolate liquor ?